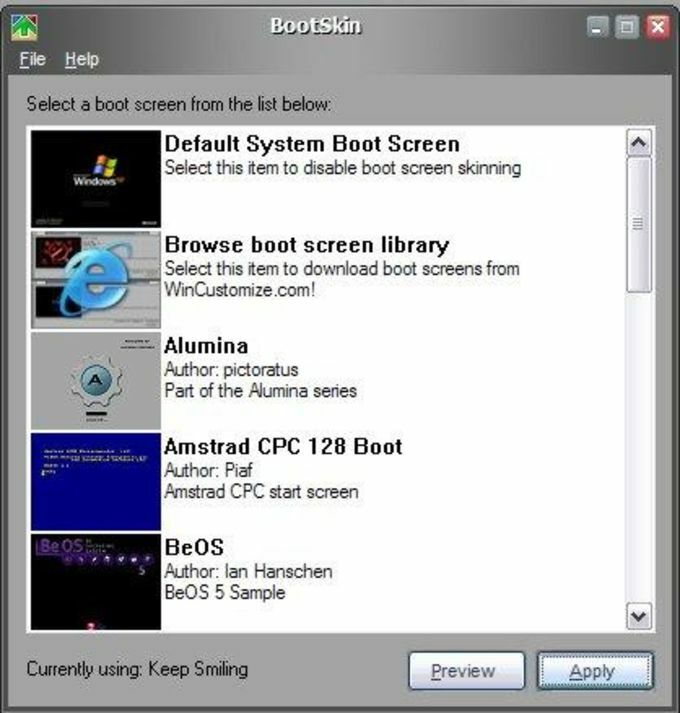 BootSkin is a good, free program only available for Windows, belonging to the category Desktop customization software with subcategory Login Screens (more specifically XP Boot Screens). Since the software joined our selection of programs and apps in 2005, it has obtained 199,788 installations, and last week it achieved 17 downloads. Its current version is 1.05a and the latest update happened on 2/8/2005. It's available for users with the operating system Windows 2000 and prior versions, and you can get it in English. BootSkin is a not that heavy software that does not require as much storage space than many programs in the section Desktop customization software. It's very heavily used in many countries such as United States, Pakistan, and Nepal. Safely and easily change your Windows boot screen. Bootskin allows you to replace your Windows bootup screen with a screen you can download from Web sites such as WinCustomize. BootSkin Win. Love it, just a simple program to change your bootskins with. And with the variety it's fun and easy to do.If you find yourself bored with your original book skin this will take you to the wonderful world of boot skinning. Anyway I like it and your might too. Just another thing we can do to waste time. What do you think about BootSkin? Do you recommend it? Why?